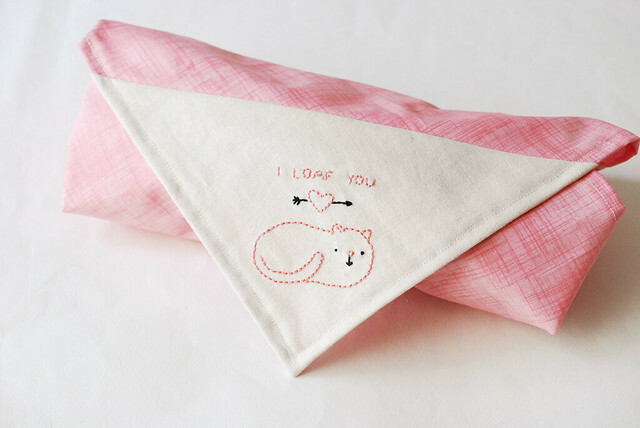 It's the last day of the Stitch Love Valentine's Blog Hop, and guess what? We've got three posts for you today! It has been so much fun to see all that these crafty friends have been making with these patterns. If you haven't yet, stop by all of the blogs and pick up all eight free patterns. My pattern today is for a cat loaf. If you have a cat, you'll be familiar with this pose. There are a few kitties in Stitch Love: Sweet Creatures Big & Small (and plenty of pups too), but there was no cat loaf. And we just needed one. 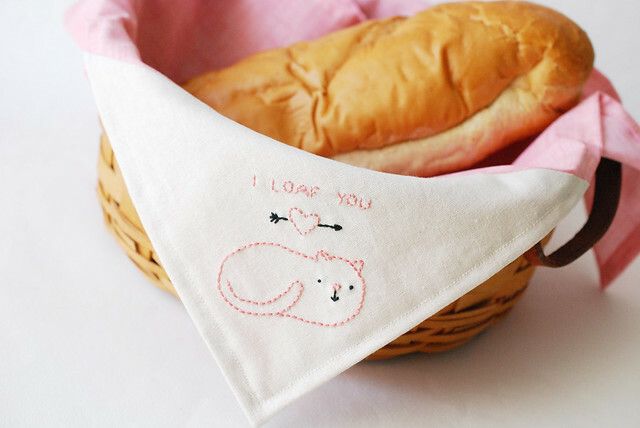 For Valentine's Day, I thought it appropriate to add a little sentiment, and what could be better than "I Loaf You." If you want to make this for someone you don't like, leave off the heart, and it sounds a bit like "I Loathe You." But you wouldn't do that, would you? But I digress. To go along with a loaf, I went for something that could be used with bread. The cloth was made just like the Holiday Mouse Furoshiki Cloth from Stitch Love. 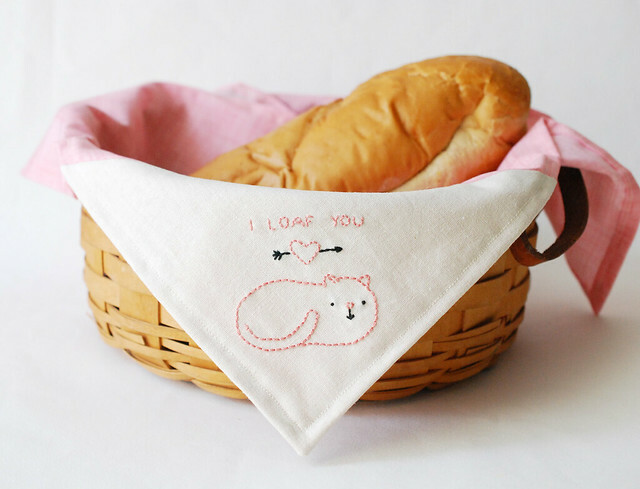 How fun would it be to gift someone with some freshly baked bread and wrap it up in a cloth like this? 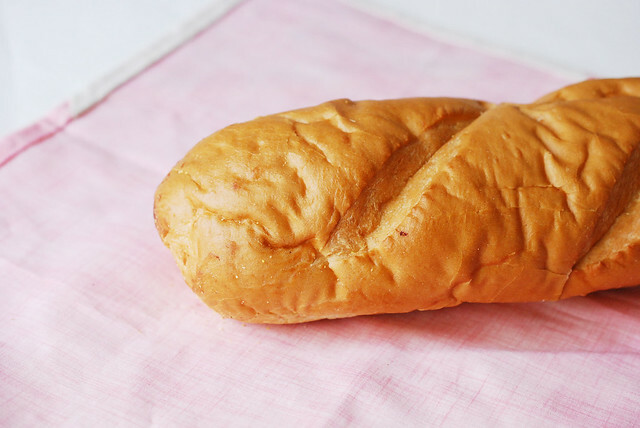 Good bread would be an excellent Valentine for me! Right now I'm keeping this cloth for myself, so we're using the cloth in a basket. Which would also be a perfectly fine way to gift some bread. Or really, anything for a cat person! Want to stitch a cat loaf? Grab your free pattern below! 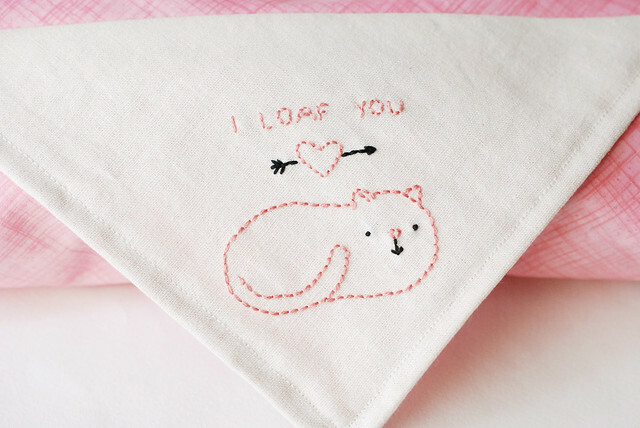 Happy hearts and cats and stitching day! And thank you again to everyone who hosted a spot on the Stitch Love Valentine Blog Hop. If you make anything with any of these patterns, be sure to share photos online and tag them #StitchLoveBlogHop so we can see! I love your patterns and your friends did such cute projects from them, now I have to make some. Thanks so much for all the sweet little animal patterns! I feel a doll quilt must be made of such sweetness! Bread and cats! My two other Valentines... I'm sure husband won't mind. Well this is pretty much the cutest thing ever.